Suitable for the maintenance and in-depth cleaning of large areas where the utmost discretion is required during cleaning operations (for surfaces up to 1,650 sqm). 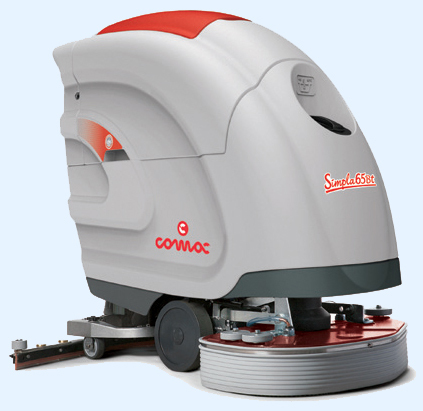 Thanks to the new soundproof head, the Simpla scrubbing machines may be used for cleaning environments such as nursing homes, hospitals and rest homes, that are extremely noise-sensitive during cleaning operations, or in retail outlets such as supermarkets during normal opening hours. The elegant instrument panel with its new digital display is user-friendly. All the commands are within easy reach: from speed adjustment to water and detergent dosing system control commands. Built-in 24V/15A battery-charger suitable for gel and traditional batteries (optional).